Recipes from Blog Posts and Appearances I hope you will try and enjoy! Zest six of the lemons into a medium pot and add the pinch of salt. Next, add the 1 1/2 cups of water and 1 1/2 cups sugar. Bring to a boil over medium high heat. Reduce the heat to medium and boil gently until the sugar is dissolved. Set aside to cool. Juice all the lemons and pour the juice into a large pitcher, being careful not to get any seeds into the mixture. Add the cooled, lemony simple syrup to the juice and stir. Add 7-8 cups of cold water, (depending on how tart you like your lemonade) stir and either serve now over ice or chill for later. Combine all ingredients in a medium bowl and serve with crackers, bread or as a filling for petit choux. Whisk together all ingredients in a medium bowl, chill and serve along with salad greens and grilled chicken. Preheat an oven to 350 degrees. Grease an 11x13-inch baking dish, 2 8-9-inch cake pans OR grease or line 24 stand-size muffin tins with muffin papers. Your choice. Sift all the dry ingredients into a large bowl. Add all remaining ingredients to the bowl and whisk to combine. Pour the batter in one large pan, distribute between pans of choice. If you decide to make cupcakes, fill muffin cups 2/3 full. Bake in the preheated oven for: 40 minutes if using the large pan, 25-30 if using the 2 cake pans OR 14-17 minutes if using the muffin tins. Test for doneness and remove the pans to a rack to cool in the pans 10 minutes before removing, cooling completely and then serving or frosting. *Note: You may wish to add 1/2 to 1 cup of mini chocolate chips to your batter. To do so, toss the chips with a tablespoon of the sifted flour mixture before adding to the mixed batter. *This cake improves the next day so it is a great make ahead meal for a picnic! Cream butter with sugar and cocoa powder. Add coffee or milk and extract. Blend until smooth, adding more coffee or milk if needed to bring to a spreading consistency. Frost your prepared cakes or cupcakes and store in an airtight container for up to 1 week. Dip clean strawberries in sour cream and then brown sugar. Enjoy. Add the butter to the pot you cooked the pasta in and allow to brown slowly over medium heat. When the butter reaches a nut-brown color, turn off the heat and add the reserved cooking water. Swirl to combine and add the pasta back to the pot. Toss and add the olive oil, reserved pasta water and herbs to the pot. Season with salt and pepper and serve. Garnish pasta with crumbled feta cheese, fresh tomato and fresh spinach or kale or zucchini ribbons if you wish. In a large bowl, add the mayonnaise and stir then add the vinegar. Set aside while you prepare the salad. Clean and chop the apples into 3/4-inch chunks and clean and slice the celery into 1/4-inch slices. Add them both to the bowl. Finely grate the onion over the top, add the parsley, almonds and raisins. Stir to combine, taste to adjust seasonings; adding salt, pepper and sugar as needed to balance flavors. Serve immediately or chill to serve later. Please note: The vinegar helps the apples to not brown so this salad will keep up to 3 days in the refrigerator. Heat a very large griddle or pan over medium-high heat the same size as the lavash and cook the lavash about 1 minute per side. Remove the lavash to a cutting board, spritz the top with a touch of water and cover with a towel, repeat with remaining dough, stacking the bread as they come off the pan. Store the cooled lavash up to 3 days at room temperature in an airtight container. The lavash will bubble up as they cook and it's fun to watch. Your kids will find it a touch magical. Remember, cooking is dynamic so adjust the heat as needed to your bread does not scorch! Combine all the ingredients in a large frying pan and cook until most of the liquid is evaporated and the chicken is completely cooked; about 15 minutes total. Serve over cooked rice with vegetables. Place mayonnaise in a medium bowl and stir to prevent lumps. Add ketchup and stir. Add vinegar and taste to adjust flavor. Add cold water to thin if you like. *Adding water will do three things; reduce the sharpness of the vinegar if it is too strong, thin the sauce for a dip AND reduce calories. *The amount of vinegar you add is driven purely by your preference. We like this dressing sharp and vinegary. Preheat the oven to 350 degrees. Remove any membrane that is clinging to the seeds but there is no need to wash the seeds; just pull off the stringy stuff. Next, heat a (nonstick) frying pan on the stove over medium heat, add a touch of oil, add the seeds and season with a bit of salt. Toss the seeds to cook them until they smell tasty and toasty, this process takes about 10 minutes. Next, roast the seeds at 350 degrees about 7-9 minutes. Serve the seeds with salads, soups, pastas or whatever. Remove from the heat. Add chocolate, stirring to melt. Serve now or make ahead and rewarm over low heat to serve later. If you wish, top a little whipped cream and serve with a glass of water to cut the richness of the chocolate. Bring the stock to a boil in a 2 quart sauce pan. While the stock is heating up, crack the eggs (on a flat surface) into a large bowl, add the yolk, salt and water. Using a handheld mixer or whisk, beat the eggs until they are thick and pale yellow, about 3-5 minutes. Beat in the lemon juice and the water and set aside. Once the stock comes to the boil, add the rinsed rice. Keeping the stock at a boil cook the rice until it is fluffy and softened, about 15 minutes. Place your bowl with the beaten egg in the sink (this is to prevent splatter BUT you may do on the counter if you wish BUT I recommend placing a towel under the bowl to prevent it from sliding) begin beating the eggs again on LOW and CAREFULLY and SLOWLY add the stock and rice mixer, as you continue beating. Continue to beat until you have added about half to all the stock mixer (adding all is my preference). Return either all the soup or half the soup to the pot and place it over low heat on the burner and stir gently, just to warm it through, do not bring to a boil again. Taste to adjust salt and add the sugar now if needed to balance the acidity of the lemon. Preheat the oven to 375 degrees. Lightly grease a 9”x13” baking dish with cooking spray. Set aside. Cook the frozen ravioli until they are just cooked or al dente. Drain the ravioli and return them to the cooking pot and toss them with the tablespoon of olive oil. Set the pot aside, off the heat. In a large bowl, combine the ricotta cheese and the egg. Set the mixture aside. Pour half a jar of the sauce into the bottom of the prepared 9”x13” baking dish. Spread one-third of the al dente ravioli over the top of the sauce. Top the ravioli with half of the ricotta cheese mixture and one cup of the grated cheese and enough sauce to mostly cover the top of the cheese.. Sprinkle the top of this layer with salt and pepper to taste. Repeat this process of layering once more. ending with the sauce as before. Bake the Ravioli Lasagna until it is bubbly; about 30-45 minutes. Serve. Add the clean potatoes to a large pot and cover with water. Bring to a boil and boil just until the potatoes are tender when pierced with the tip of a sharp knife; about 8-12 minutes from when the water begins to boil, depending on the size of the potatoes. (Add the 2 teaspoons of salt after the water comes to the boil.) *Check the potatoes starting at 6 minutes. Combine all the vinaigrette ingredients, except the olive oil, in a medium bowl and whisk until combined. (You may wish to place a wet towel under the bowl to help the bowl remain stationary during whisking.) While continuing to whisk, slowly add the olive oil in a steady stream until the mixture is emulsified and combined. Taste the dressing now for salt and pepper by using a potato. *The key to seasoning a dressing properly is to taste the dressing with what you will be eating the dressing with; for example lettuce or, as in this case, a potato. Savvy? This way, you season your dressing perfectly every time. Drain the cooked potatoes and return them to the pot. *(Keep the potatoes off the heat.) Add the vinaigrette to the pot of warm potatoes and using a rubber spatula, gently toss the potatoes until they are completely coated with the dressing. Continue to gently toss the potatoes as they cool to become slightly warm or room temperature. *Most all of the dressing will become absorbed by the potatoes. Taste the potatoes and adjust the seasoning before serving. Heat the oil and 1 tablespoon butter in a large, lidded frying pan, over medium high heat. Add the onion to the pan, breaking up the quarters as you go. Adjust the heat to medium low and cook until the onions are caramelized, about 10-15 minutes. (DO NOT rush this step.) Add the sugar and then the bratwurst, nestling them among the onions Add the bottle of ale and bring the mixture to a slow boil. Cover the pan, reduce the heat to low and allow to a simmer and cook for 20 minutes. After 20 minutes, uncover the pan, raise the heat to medium and continue cooking the bratwurst, turning occasionally, until the beer cooks down and is evaporated, about 10-20 minutes longer. Remove the onion with a slotted spoon to a dish, cover it and keep the onions warm. Raise the heat to medium high and brown the bratwurst evenly on all sides. Remove the bratwurst and place them inside each buttered bun. Top the bratwurst with the caramelized onion. Serve with grainy mustard. Preheat the oven to 350 degrees. Line a rimmed baking sheet with parchment paper and set aside. Remove the cookies from their package and place them into a resealable bag. Break the cookies into irregular pieces and chunks, being careful NOT to turn the cookies in cookie crumbs. Place all the cookie pieces onto the prepared sheet and bake until lightly golden brown and crisp; about 15-20 minutes. Allow the cookies to cool and serve the Crispy Topping to the Ice Cream Sundae. Preheat the oven to 350 degrees. Line two baking sheets with parchment paper and set them aside. Chop the candied orange peel, place it into a large bowl and then set the bowl aside. Place the nuts, chocolate, sugars, coffee granules, cinnamon, zest and salt in the bowl of a food processor that has been fitted with a metal blade. Pulse and process until the nuts are finely ground and only a few chocolate chunks remain, about 1 minute. Pour out the ingredients into the large bowl with the candied peel, toss to combine the ingredients and then set the bowl aside. Return the bowl to the processor and add the eggs and oil to it. Process until the eggs and oil are well combined; about 15 seconds. Add the egg mixture to the flour mixture and mix well, first with a sturdy spoon and then with your hands, kneading the dough until it is well combined; being careful not to overwork the dough. The dough will be very stiff and not much will stick to your hands. Remove the dough to one of the prepared sheets and divide it in half, placing one portion of dough on each sheet. Roll and pat each half of dough in an 11 1/2” X 3” X 3/4”-thick flat log. Sprinkle one (1) tablespoon of sugar over the top of each flat log. Bake in the preheated oven 16 minutes. After 16 minutes, rotate and reverse the positions of the pans, return them to the oven and continue baking for an additional 14 minutes. (*This rotating and reversing positions of the pans will help ensure even baking.) After a total of 30 minutes baking time, remove the logs and allow them to rest for five (5) minutes before continuing with the next step. *Keep the oven on. After five (5) minutes, carefully transfer the logs to a cutting board and slice each into 1/2”-thick slices. (I either slide them on or use a thin, flexible cutting board.) Place the slices on the pans, cut-side down, return the pans to the oven and toast the cookies eight (8) minutes per side. To cool the biscotti, either stand them upright on the sheet pan to cool OR remove the biscotti to racks to cool completely. Store in an airtight container up to two weeks. 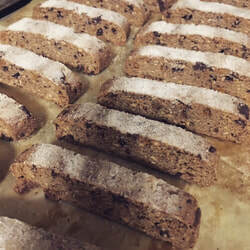 *PLEASE NOTE: Sometimes biscotti break during the transfer to the cutting board.. DO NOT panic! It is fine! Simply slice off the bit that is jagged and eat the evidence! Roll out the sheet of puff pastry to a 1/16-inch thickness on the parchment paper you will use to line the rimmed sheet. Slice the puff pastry, widthwise or lengthwise, into long, thin strips (the thickness is up to you but less than 1/2-inch works best sticks.) Sprinkle the top of the cut puff pastry with "Shake Cheese" and whatever seasonings you like. Separate the puff pastry about 1/2-inch apart and place the parchment, sticks and all, onto the baking sheet. Bake until the sticks become puffed and golden brown, about 15-20 minutes. Serve. Preheat the oven to 375 degrees. Get all your ingredients ready (Mise en place). Combine the mayonnaise and mustard in a small bowl. Set aside. Combine the breadcrumbs and cheese on waxed paper, parchment paper or a plate. Set aside. Line a rimmed baking sheet with aluminum foil and then with parchment paper. Set aside. Cut the bacon slice in half and slice each half into -1/2-inch slices. Stuff the center of the butterflied breast with 3/4 of the cheese slice. Slather the top of the breast with the mayonnaise mixture, place in the breadcrumb mixture and slather the top side with more mayonnaise mixture. Coat the top with breadcrumbs and place on the prepared sheet. Repeat with the other breast. Top each prepared breast with the remaining cheese slice and then a half slice of bacon. Bake until the bacon is crisp and the breasts are golden brown, about 25 minutes. Serve. In a medium sauce pan, simmer the Chili's with the water, vinegar, 2 tablespoons brown sugar and 8 cloves of garlic until they are very soft and tender; this could take up to an hour. Set the mixture aside to cool. Heat a large frying pan over medium-high heat until it is very hot. While the pan is heating, pat the pork chops dry and season on one side with salt and pepper to taste. When the pork chops are cooked, remove the to dish and cover. KEEP the than pan on the heat. In the same frying you cooked the pork, add the garlic, carrots and leeks and sauté over medium heat until the leek becomes tender, about 3 minutes. Add the Romesco Sauce and cream. Stir to combine. Return the pork chops and any accumulated juice to the pan. Serve over rice with any vegetables you wish. Enjoy! Preheat the oven to 375°. Line three cookie sheets with parchment paper and set them aside. In the bowl of a heavy stand mixer, cream the butter and shortening for one minute, then add the salt, brown sugar and vanilla extract. Allow to cream for 5 to 7 minutes until the mixture lightens and becomes fluffy. Add the egg and mix one additional minute to combine well, scraping the bowl as needed. While the butter and sugar are creaming, sift the dry ingredients over a sheet of waxed or parchment paper to combine and set aside. Measure the wet ingredients into a glass measuring cup by first pouring the coffee then the oil and then enough additional buttermilk to make one cup total liquid. Set this mixture aside. After you add the egg, add the dry and wet ingredients alternately, beginning and ending with the dry ingredients. (Add 1/3 of the dry ingredients, 1/2 the liquid ingredients and so on.) Scrape down the bowl as needed to make certain all the ingredients are incorporated. Clean the beater, grape the ball down one more time and cover the batter with plastic wrap. Chill the dough for one hour, preheating the oven after halfway through. Portion the cakes into (2 tablespoon-sized) dollops using 2 spoons or a scoop and space two inches apart on the prepared cookie sheets. Bake in the preheated 375° oven for 10 minutes. Remove and allow the cakes to cool completely on the sheets. Whisk to combine the ingredients well. Whisk the ingredients until they are fluffy and well combined. Slant the bag slightly and carefully spoon the Fluff Filling into one side of the bag. Then spoon the Peanut Butter Filling into the other side of the bag so you have two types of filling inside the bag. Don't worry if the two fillings start to mix, that's the idea! Pipe the Filling onto the bottom of half the Cakes, distributing the filling evenly and then top each with a second cake. Viola! You now have Whoopie Pies! Store the pies wrapped individually. Place 1 tablespoon butter into a 9-inch pie plate and then place the plate in the preheated oven to allow the butter to melt while you prepare the pancake batter. In a medium bowl, whisk the eggs with the milk and the salt. Add the flour and continue whisking until the flour is well incorporated and as lump-free as possible. *NOTE: This step may also be done in a blender or food processor. *NOTE:To prevent burning, keep the hot pad you used to remove the plate from the oven right next to or touching the plate. This way, you won’t forget to use it and pick up the hot plate. Carefully pour the batter into the hot pan. Bake the Pancake until it is puffed and golden around the edges; about 15-20 minutes. While the Pancake is baking, prepare any savory toppings you wish such as; a fried egg, sliced avocado, a green salad, etc. To serve: Remove the baked Pancake from the oven and serve right in the hot pie plate set on a dish or remove the Pancake to a dish and place any Savory Toppings you wish on the top. Place the frying pan on the stovetop over medium-low to medium heat. Cube the bread while the pan is heating. Place the loaf of bread on the cutting board and slice into 1-inch cubes. Mince the garlic cloves if using. Pour the olive oil into the heated pan and add the bread cubes. Toss and season the bread cubes with salt, pepper and cayenne pepper if using. Add the minced garlic. Continue to toss the bread frequently until the cubes become crisp and golden brown. Serve immediately or allow the Croutons to cool and then store them in an air tight container up to one week. Add the butter to the pot you cooked the pasta in and allow it to brown, slowly, over medium to medium-low heat, adjusting the heat as needed. When the butter begins to turn a light, nut-brown color about the edge of the pot, turn off the heat and allow the residual heat of the burner and pot to continue cooking the butter BUT keep an eye on it! The butter can go from browned to burn quickly! Gently swirl the butter around in the pot and then add the olive oil if you are using it, the pasta water and the herbs and gently swirl the pot again to combine the ingredients. Finally add the cooked pasta back to the pot. Use tongs or two forks to toss the pasta to coat it with the butter and herb mixture. Season with salt and pepper as needed and serve. Place the chocolate melts in the microwave proof bowl and microwave in 20 second intervals until the melts are melted and smooth. Line a baking sheet with waxed paper or parchment paper while the chocolate is melting. Dip the ice cream cones into the prepared chocolate and either place on the prepared baking sheet to cool now or dip the chocolate cones into any combination of optional additions you like and then set the cones aside to cool. NOTE: The cooling and setting time will be shortened by placing the dipped cones in the refrigerator until the chocolate is set. Preheat the grill pan over medium heat while the chicken is being cut up. Tie your hair back. Place the chicken on a cutting board in the sink, backbone up. First, remove the chicken’s backbone. Using kitchen shears or a sharp knife, cut or snip along both sides of the backbone, as close to the bone as possible. *NOTE: Place the backbone in a resealable bag and freeze for another use such as stock. Cut or snip the little thingy. Keeping the chicken in the sink, open the chicken up by slitting the cartilage that is right at the top of the breast. *NOTE: Be careful when doing this because the bones can be sharp. Give the chicken a pat dry. Pat the chicken dry and remove any yucky bits. Rub the chicken all over with 1 1/2 tablespoons of the oil. Use the remaining oil to oil the grill or grill pan. Place the chicken, ribs down, on the preheated grill pan and cover with a large, domed pot lid or another pot, until the chicken is cooked through and measures 165 degrees with a culinary thermometer; approximately 60-75 minutes, flipping the chicken halfway through the cooking time. *NOTE: Run the stove fan during cooking and make certain the kitchen is well ventilated or the smoke alarm may be set off. Allow the chicken to rest 5 minutes before serving but the skin may become soggy. *My husband, Russell, cooks the chicken on an outdoor 325 to 350 degree grill, rib-side down for 20-25 minutes, turns it over and cooks it meat-side down for 20 to 25 minutes more. Then, to finish cooking the chicken; he flips it once more and cooks it 20-25 minutes longer, bone-side down. Combine the eggs and sugar in the bowl of a heavy duty mixer and mix at medium speed until light and thickened; about 7-10 minutes. Add 2 cups of all purpose flour then the baking powder, mix to combine and then add 1 cup more plus any additional flour as needed, 1 tablespoon at a time, until a workable dough that is not too sticky has formed. Switch to the dough hook and knead in the oil, 1 tablespoon at a time, until all the oil is incorporated. Pour enough oil into a shallow frying pan so the bottom is covered by 1-inch. Heat to 250 to 260 degrees, no higher. Remove the dough to a floured surface and divide it into four portions. Roll each portion as thinly as possible. Cut into 4X6-inch pieces. Gather a piece of rolled dough and place it between the tines of the carving fork, about an inch away from the very bottom. Hold the fork with your right hand and the dough away from you over the oil with your left hand. Place the 1-inch overhang in the hot oil and slowly and mindfully begin to twirl the dough around the tines of the fork to create a loose roll. The dough will bubble up, you want this... If you need to use a knife to hold the end of the dough in place, do so. Cook only until the dough is crisp and very pale; being careful the oil does not get too hot. Remove the crisp diples very gently with tongs to a towel-lined cooling rack and repeat with all the remaining dough strips. Drizzle the diples with honey, cinnamon and finely ground walnuts to taste when they are cooled. NOTE: These may also be made by hand but why? Preheat the oven to 350 degrees. Grease and line a large bread tin. In a large bowl, combine the eggs, oil, yogurt, sugars, and extract with a large wooden spoon. Add the flours, wheat germ, spices, leavening and salt, and stir to just combine. Mash the bananas on a plate with a fork and stir them in along with the whipped butter. Pour batter into prepared pan and bake for about 45-60 minutes, until the bread is golden and set and a cake tester comes out clean. Allow bread to cool in pan for about 15 minutes before removing and transferring to a wire rack to finish cooling. Tie your hair back. Heat a large pot over medium heat. Add the butter and oil to the pot. Add the onion, carrot and celery and saute until the onion begins to wilt, about 5 minutes. Add the garlic and flour. Cook, stirring, for 2 minutes. Stir in the stock, pasta, chicken, tomatoes, half the basil and half the parsley. Raise the heat to medium-high. Cook until the pasta and chicken are cooked; about 10-15 minutes. Add the milk and the remaining herbs. Bring only to a simmer and serve the soup, garnished with extra parsley if you wish. Feel better! Tie your hair back. Preheat the oven to 375 degrees. Beat all chocolate layer ingredients until the sugar is dissolved. Pour into the bottom of the baked crust. In a medium bowl, sift or whisk the flour and baking powder, set aside. In a separate bowl, Cream the butter, salt and sugar until fluffy and then add the vanilla, then egg. Add the flour and milk alternately, beginning and ending with the dry ingredients. Carefully spoon the batter on top of the chocolate layer, making sure the entire top of the cake is covered with no chocolate visible. Bake 30-40 minutes, until fully cooked and golden. Remove the cake and cool on a rack at least 1 hour before slicing. Spanikopita from my cookbook, "Cooking Up Life"
Spanikoptia is in the burek family of pastries and is a savory Greek pie. Tie your hair back. Preheat the oven to 375 degrees. Gather a rimmed baking sheet and a 9X13" casserole dish. Line the baking sheet with foil and place the casserole dish on it and set them aside. Heat a small frying pan over medium high heat, add the olive oil and onion. Saute the onion until it is translucent; about five minutes. Set the pan aside, off heat, to cool briefly while you assemble the remaining ingredients. In a large bowl, combine all the other ingredients. Add the cooled onion to the bowl and stir the mixture to combine it well. Set the Filling aside. Combine the 1/2 cup butter and the 1/4 cup olive oil in a bowl or measuring cup. Set aside. Open and unroll the phyllo dough and cover it with a slightly damp towel. (*Covering the phyllo is optional because if you work quickly the dough will not dry out.) Working quickly, brush the inside of the casserole dish with some of the melted butter and olive oil mixture and place one sheet of phyllo dough in the dish so it covers the bottom and sides; don't worry if there are tears or the entire dish is not covered, you can fix any holes with the forthcoming layers. Brush the entire phyllo sheet with the butter mixture and top it with a second sheet of phyllo dough; patching wherever is needed. Repeat these steps 4 more times until you have a total of 6 layers that have been stacked and buttered. To the top of the 6th layer, add 1/3 of the prepared filling. Top this layer of filling with a sheet of phyllo dough and as before, butter that sheet and top it with a 2nd sheet of phyllo and butter the top of that sheet too. Now, top this phyllo layer with 1/3 more of the spinach mixture. Repeat this process of layering the spinach mixture and topping it with 2 phyllo sheets once more; so you have a total of 3, separate layers of filling and phyllo. Top the 3rd and final layer of filling with the remaining sheets of dough, buttering between the layers as before. When you get to the top layer of phyllo, use any remaining butter mixture to thoroughly butter the top and all the edges of the pan. BEFORE baking the Spanikopita, use a sharp knife to score the phyllo dough about half-way through into desired serving sizes and then bake the Spanikopita in the preheated oven until it is a deep golden brown; about 40 to 60 minutes. Allow the Spanikopita to cool 30 minutes before serving. To serve, slice all the way through the scored portions. Please be aware, the filling remains VERY hot so be careful. Heat an oven-proof frying pan over medium heat until very hot. *As the pan is heating, place the chicken on the cutting board and pat dry with the paper towels. Then, season the chicken breasts on one side. Set aside. Wash up. Melt the ghee in the hot pan. Carefully add the chicken breast, seasoned side down, laying each breast in the pan away from you to avoid getting splattered on and burned. *Season the top side of the chicken breast now. Allow the chicken to brown 5-6 minutes before turning and browning the other side an additional 5-6 minutes. Remove the pan from the heat, scatter the scallions over the top and bake in the preheated oven until the chicken is cooked through and the breasts register 165 degrees on a culinary thermometer; about 20-25 minutes longer. Serve with a salad, steamed vegetables and a baked potato or rice. Tie your hair back. Create an herb bundle or “bouquet garni" by gathering the thyme sprigs and the bay leaves and then tying them together with kitchen twine. Set aside. Place the pot on the stove and heat it over medium heat. *NOTE: Bouquet garni is meant to flavor a dish, not be served with it so don’t forget to remove the bouquet before serving. While the pot is heating, pat the chicken dry and season both sides with salt and freshly ground white and black pepper. When the pot is the hot, add the olive oil. Use the tongs to place the seasoned chicken into the pot, skin-side down. *NOTE: The bouquet garni will remain in the pot throughout all the cooking process. Cook the chicken 10 to 15 minutes per side, until it is a deep, golden brown; adjusting the heat as needed. While the chicken is browning; chop the onions, garlic and bacon. Once the chicken is browned on both sides, use a slotted spoon to remove it and place it on a platter. Cover the chicken with foil and set it aside. Return the pot to the burner and keep the heat at medium. Add the bacon to the pot and cook until it is crispy. Remove the bacon and place it on a different platter than the chicken. KEEP THE BACON DRIPPINGS in the pot! Again, return the burner to the heat. Add the onion and garlic to the pot and saute them in the bacon fat. Season the onion and garlic VERY lightly with salt and the two different types of pepper. When the onion is translucent, (about 3 minutes later) use the slotted spoon to remove the onion and garlic and place them on the same platter as the bacon. Again, return the pot to the burner and KEEP any drippings in the pan! Add the mushrooms to the pan. Season with a BIT of salt and the peppers if you wish, adding 1 tablespoon olive oil to prevent sticking IF little or no drippings remain. Saute the mushrooms 3 minutes, using the slotted spoon to stir them frequently to prevent them from sticking. After 3 minutes, add the carrots, celery and a LITTLE more, seasoning if desired. While the carrots and celery are sauteing, use a whisk to combine the tomato paste with the brandy in a small bowl. Set the mixture aside. Once the carrots and celery have cooked for 3 minutes, remove them to the platter with all the other vegetables and the bacon. Place the pot back on the burner. Return the chicken to the pot and RESERVE any juices that may have accumulated in the platter. STOP and re-read the instructions below BEFORE proceeding! *Remember, if you are using a stovetop-vented fan, TURN IT OFF BEFORE you ignite the brandy! Also, try to use an outside burner, not one that puts you in a corner. Get your long matches or stick lighter now. Pour the combined tomato and brandy mixture over the top of the chicken. CAREFULLY and quickly use a long match or stick lighter to ignite the brandy and stay clear of the pot until the flames subside. DO NOT peer over the top of the pot as you light the brandy! DO NOT walk away from the pot, leave the kitchen OR answer the phone! Once the flames subside, add all the cooked vegetables to the pot along with any juices that may have accumulated in that platter and the platter that held the chicken. Now, add the entire bottle of wine to the pot. Adjust the heat to medium-high and bring the whole mixture to the boil. When it begins to boil, cover the pot and reduce the heat to low. Simmer the Coq au Vin over low heat for 40 to 45 minutes; until the chicken is cooked through and its internal temperature measures 165 degrees on a culinary thermometer. *During the last 5 minutes of cooking, combine the flour with the chicken broth in a small bowl. Set aside. When the chicken is cooked through, use tongs to remove it to a platter and cover it with foil. Set aside. Return the pot on the stove and adjust the heat to medium-low heat. Quickly whisk the flour and broth mixture into the boiling sauce. Allow the sauce to boil 2 minutes, whisking constantly, until the sauce becomes thickened and smooth.To finish the sauce, whisk in the butter. Add the chicken back to the pot along with any juices from the platter and stir the mixture. Serve with a crusty bread if you wish. *NOTE: Coq au Vin may be made up to two days ahead and reheated slowly, covered, in a preheated 300 degree oven OR low heat on the stovetop. Place the chocolate in a medium, microwave safe bowl. Set aside. Heat the cream to a simmer in a separate, microwave safe bowl or measuring cup or on the stovetop in a small pot. (Remember, *a simmer is when tiny bubbles appear around the edges of the liquid.) Pour the heated milk over the top of the chocolate and leave the two to sit about 30 seconds. Using a spoon or a spatula, beginning stirring the chocolate from the center, in tight circles; until the mixture begins to melt. *If the chocolate is not melting once you have added the cream, return it to the microwave, and heat it in 15-20 second intervals. (These short heated bursts in the microwave will help to prevent the chocolate from scorching.) As the chocolate melts, widen the stirring motion outward, toward the edge of the bowl until the mixture becomes smooth. *Stirring in this manner will help prevent the ganache (yep, you just made ganache) from sloshing all over the counter (and you). Next, stir the butter into the chocolate to create a glossy, yummy treat. Serve the Dip immediately with cake cubes, fruits, marshmallows, potato chips, pretzels, cookies, hunks of chocolate and other treats. Tie your hair back. Fold the top portion (the resealable part) of a one-gallon resealable bag back and place it into a 9”x13” baking dish. Now, pour the coffee, buttermilk and oil and seasoning into the bag and set the whole thing aside. 2. In case of leakage. Place the chicken on a work surface and pat it dry with paper towels. Poke the chicken all over with a fork. Place the chicken inside the resealable bag with the marinade and seal it closed. Lay the bag flat inside the baking dish, so the chicken is covered with the marinade. Marinate the chicken at least 1 hour (at room temperature or up to 24 hours (in the refrigerator.) After at least 1 hour, remove the chicken from the marinade, place it in the baking dish and season it again, lightly, with salt and pepper to taste. Trim the pork tenderloin of the silverskin and cut it crosswise into 1-inch-thick medallions. Pat each medallion dry and season with salt and pepper. Heat 1 tablespoon of the whipped butter and the oil in a large, frying pan over medium-high heat. Arrange the medallions in a single layer in the skillet and cook about 3-4 minutes on each side, (The pork will be slightly pink inside and measure 165° on a culinary thermometer.) Transfer the medallions to a plate and cover with foil to keep warm. Return the pan to the heat and add the wine and chicken stock to the skillet. Bring the mixture to the boil, reduce the heat to low and simmer 4-5 minutes to reduce slightly. Stir in the tomato paste, grapes, and apricots. Increase the heat to medium and allow the sauce to boil about 2 minutes, or until the sauce is slightly thickened and the grape skins are on the verge of bursting. Turn off the heat and stir in the remaining 1 tablespoon of whipped butter. Return the pork and any accumulated juices to the pan and serve. To serve: Divide the arugula between four plates and then arrange the medallions on top before coating each with the sauce and then the grapes and dried apricots. Serve with buttered bread. Homemade Lilac Extract130 grams (4.5 ounces) lilac blooms, including small stems, will yield about 50 grams (1 ½ ounces) of plucked blooms, enough for both phases of the distillation process. 1 . Place the lilac blossoms, still attached to small stems, in a colander. Place the colander in the sink and gently wash the blooms. 2. Pluck or cut the blooms from each cluster, being careful to leave the green bit at the end which can cause the extract to taste bitter. 3. Fill an 237 ml (8-ounce) glass canning jar with the blooms to the fill line (or .6 cm/¼ inch from the top) as shown in the photograph. Carefully tap the jar on a surface to gently compact the blooms. 4. Pour vodka over the blooms to cover them completely, place the lid on the jar and turn to seal closed. 5. Place the jar in a dark place and allow the blooms to steep in the vodka until the blooms turn pale and nearly translucent. (This should take 2 days.) This is the first distillation phase. 6. Drain the vodka and blooms through a fine mesh strainer set over a 473 ml (2-cup) spouted measuring cup and press firmly on the blooms to remove as much liquid as possible. Reserve the vodka infusion, which should now have a slightly floral scent but discard the lilacs. 7. Fill the jar with fresh lilac blooms as before. This time, pour the reserved infused vodka over the top. Replace the lid and once again store the jar in a dark place until the petals become nearly translucent. 8. Repeat this process of straining and replacing until the vodka smells like lilacs, probably 4 times total. 9. When the infusion is strained for the final time, press out as much liquid as possible and discard the blooms as before. This time, strain the last infusion of liquid through a paper towel-lined fine mesh strainer into a clean 473 ml (2-cup) spouted measuring cup and taste the extract. If a pinch of sugar is needed to balance flavors, make that adjustment. 10. Pour the lilac extract into a glass bottle of choice, label, and store. Use whenever a recipe calls for extract.